Lancome isÂ so generous to give my readers special privilege to try out their amazing products that I use on my picture aboard. Want to know how? Read more! My skin is not so great to begin with, I suffer with some skin problems like everyone else, and so I put a lot of make up and touch up the photos, but seriously, I don't touch up my skin on these pictures! All thanks to Lancome! My skin looks healthily flawless and radiant, almost like not put anything and seem like i was born with an amazing skin. whereas in fact I CHEAT! TOTALLY FREE FROM PHOTOSHOP! I SPEAK TRUE! Now all of you can have great skin like what I have experienced before! Lancome is so generous to give every readers of mine who would like to try these 3 main products that successfully improved my skin! Call it FLASH MIRACLE MAKE OVER! 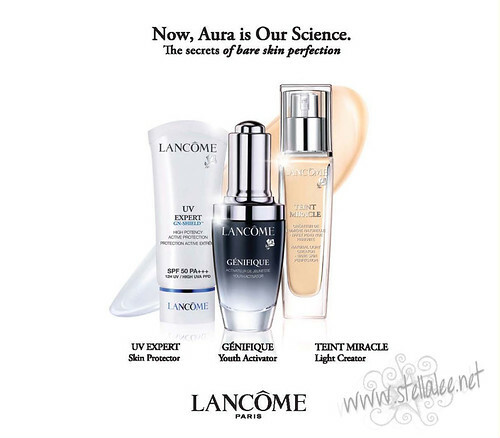 Because you will receive 3 product samples of Lancome best seller products for FREE! Use UV Expert that works amazing to protect your skin from UVA and UVB by its SPF 50 PA++, it also helps to even out your skin tone as well! Last, the almighty Teint Miracle Foundation that promises to hydrates your skin for 18 hours, oil free, and reflects your aura. A light weight foundation that works amazing for everyone, also used by Kate Middleton on her Royal Wedding! How to win this amazing prize? Simple! You only need to follow these rules! Afterward, please check your email within 1x24 hour because I will send you the code! Please note that one person only can win one prize, and you have to come directly to the selected counter to pick up your gift by yourself. Also, even though it's not a must, I hope for everyone who has blog would post about this giveaway on your blog to spread beauty and love toward Lancome so everyone can have perfect beauty skin together! The winners will be chosen by Lancome and will be notified by their staff directly, and its first come first served, so people who complete the rules first will be entitled to win this awesome giveaway. WHILE STOCK LASTS! There will be no how many winners, everyone can win this as long as the stock lasts and you've completed the mission! Get your family, friends, neighbors, co-workers, and everyone to join this because it's just too awesome to be missed! btw, klo gak di jakarta ga bs ikutan kah? counternya kok jakarta smua? Followed their twitter, facebook fanpage, and add friend too. Done already like their facebook fanpage, follow twitter and add friend too. OMG, only that selected counter eh? so that's mean I can't pick it up in Surabaya? CANINE :D is via twitter fine? whats your google friend connect name? have you followed all the rules? oia, i dont have twitter account so i cant follow Lancome's twitter acc. can i still join this giveaway? i dont have twitter account so i cant follow Lancomeâ€™s twitter acc..
Is Kevjumba the next Super Junior's Member? New Host, New Domain, New Blog!